No plumbing or hard wiring required! How do I connect a single phase unit? The future wave unit simply mounts on any wall or structure, then plug your pump into the future wave unit. 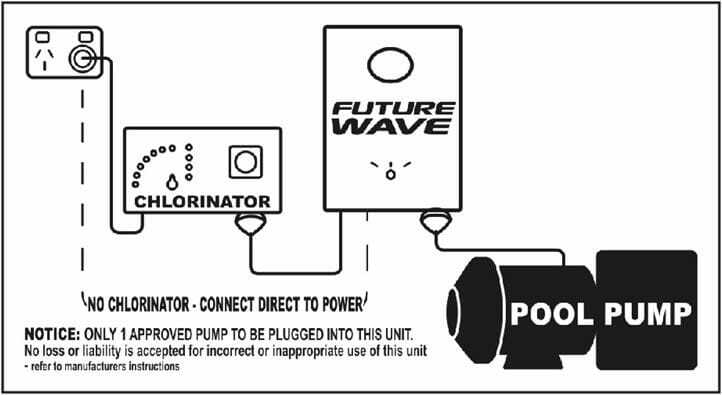 The future wave unit then plugs into the main power plug where your pump was plugged in. NO plumbing or electrical changes needed. By adjusting the frequency, optimum electrical efficiency is achieved. Will it effect my Crawller Cleaner? No. All the brands tested have performed with no changes in effectiveness. Barracudas & Creepy Crawlies in all cases so far, we have found an improvement in the performance of the cleaner & in all cases so far are using the high saving setting. However, if the pump is below .75kw (1h.p.) the MED or LOW setting may be necessary. 1 year and if any fault does occur the entire unit will be replaced (not repaired) as per warranty terms. No simply switch the future wave to bypass vacuum away then return to the selected setting when finished. 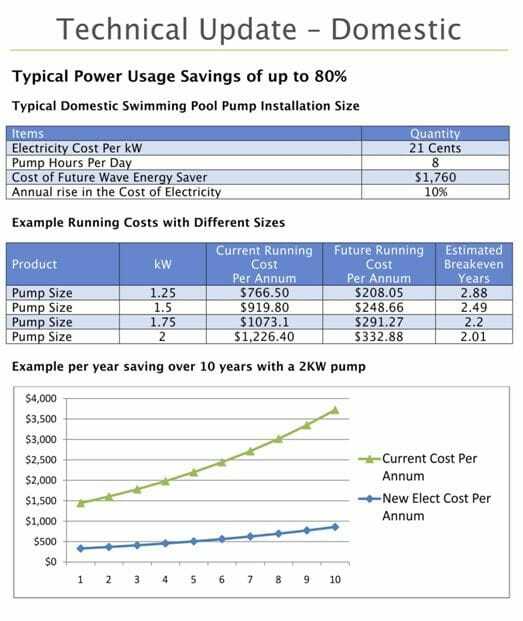 By using the future wave energy saver the water clarity of your pool generally improves as water is passing through the filter much more efficiently. By using the future wave energy saver there is a substantial noise reduction of your pump. Some users at first keep checking to see if the pump is running because it is so quiet. We are not changing the size of the pump just the flow. A smaller pump my run at the same watts as the Future Wave Energy Save but it doesn't have the same torque. A 400w (1/2h.p.) pump would not be capable of pushing the water through the filter. Using the technology by changing the waveform, voltage and frequency to the motor, it changes a motor that only requires 1800w to start the system and thereafter running as a maximum efficient 400w capable of enough torque to maintain flow.